Shiner's Amanda Mayberry gets a hug from coach David Goetz and teammate Amy Downey after scoring the game-ending run in the bottom of the fifth inning Saturday against Bosqueville. Mayberry's inside-the-park home run ended the game due to the 10-run rule. AUSTIN - On a history-making day at Red and Charline McCombs Field, the Shiner Lady Comanches showed exactly why they are the top Class 1A softball team in the state of Texas. Shiner became the first team in any classification to win back-to-back state titles and remained the lone Class 1A state champion with an 11-1 five-inning victory over the Bosqueville Lady Bulldogs on Saturday. "What a great way to end the year," said a jubilant coach David Goetz just before getting a victory bath from his team. "This is one of the greatest feelings in the world," echoed pitcher Courtney Pietsch, selected the game's most valuable player. "Back-to-back - it's never happened before." 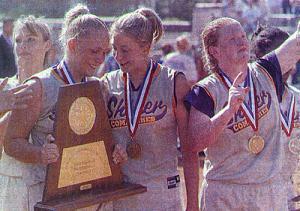 The Lady Comanches claimed the 2001 state title with a 2-0 win over Joaquin. Shiner ended the year on a 10-game winning streak and a 16-5 record. Bosqueville finished at 25-12. Despite giving up a solo run in the first, the Lady Comanches dominated the contest from the get-go, scoring all the runs they needed in the bottom of the first. After a four-run first, the Lady Comanches crossed the plate in every inning but the third and put the game away in the fifth with two outs. With runners on first and second, sophomore Amanda Mayberry lined a 2-2 pitch from Megan Horner that cleared the bases when the ball rolled past center fielder Lindsey Gray. "Coach Goetz told me all we needed was three runs when I came to bat," said Mayberry. 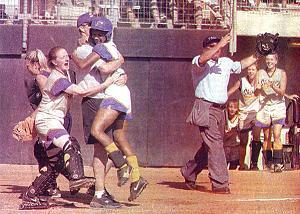 "As I got to first, coach (Paula) Lester told me to run and that's what I did." Mayberry circled the bases with Melissa Malina and Chelsea Lauer scoring in front of her to put the game away with their second straight 10-run rule contest. "I told her all we need was three runs and she had to score when she hit it," said Goetz. "You got to have a little luck, but what a way to put the game away." The Lady Comanches also got a big defensive gem from senior right fielder Kelly Kloesel after Pietsch, got herself into a jam in the top of the fifth. Pietsch loaded the bases with a hit batsman and two walks.Calei Tekubie then lined a low liner to right that Kloesel gloved and fired home with the runners going. Catcher Amy Downey then fired back to third to double off Lindsay Gray who failed to tag, completing the double play to end the game. "That catch by my senior in right was just awesome," said Goetz. "It speaks highly of the character of this team. They're very tough mentally, work hard and they really deserved this." Shiner's Hailey Michalec, above, slides safely into home plate ahead of a throw to Bosqueville catcher DeAnna Cowart in the second inning of their Class 1A championship game Saturday. Below, the Lady Comanches hold the Class 1A championship trophy and salute their fans during the gold medal ceremony. From left are Rachel Patek, Kelley Kloesel, Courtney Pietsch, and Amy Downey. After tossing a no-hitter in a 10-0 semifinal win over Collinsville, Pietsch found herself in trouble in the first against Bosqueville. Tekubie lined a one-out single into left field off the glove of shortstop Cherise Kaspar. DeAnna Cowart then slapped a shot by first baseman Hailey Michalec into shallow right field where Kloesel retrieved the ball only to overthrow third baseman Melissa Boedeker allowing Tekubie to score. "We knew we had come to play and we never really worried about the first inning," said Pietsch. Pietsch settled down and retired the next 10 batters she faced and would not allow another hit. Shiner bounced right back by sending nine batters to the plate in a four-run first. "The first inning showed the exact character of this team," said Goetz. "That one run didn't faze them at all. These girls will play seven innings all the way with just about anybody." Shiner added two more in the second as Chelsea Malina beat out an infield single and moved to second on a passed ball. Michalec then ripped a triple to right center, before scoring on a sacrifice fly by Kaspar. Shiner took advantage of two Bosqueville errors to tally twice more in the fourth for an 8-1 lead. Michalec delivered a one-out single to right and then raced around to score on a throwing error by Tekubie on a grounder by Kaspar. Kaspar managed to move all the way to third on the play and then beat Tekubie's throw home on a grounder by Boedeker. Pounding out 20 hits in two games, the Lady Comanches continued their offensive fireworks in the deciding fifth inning. "At the beginnign of the year we didn't know quite for sure how good our pitching was going to be so we focused hard on our pitching," said Goetz. "Then our pitching and defense came around and it made us a complete team." DeAnna Cowart. Courtney Pietsch and Amy Downey. W - Pietsch 14-4. L - Horner 19-7. 3B - (S) Hailey Michalec. Bosqueville 4; Shiner 2. 3B - Michalec. HBP - Gray. SH - Lawhon; Michalec. SF - Kaspar. SB - Cowart. Win - Pietsch (14-4). Loss - Horner (19-7). Save - None. (0-0); Malina,C advanced to second. 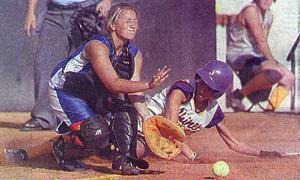 Malina,C advanced to third on a passed ball. reached on a fielder's choice, RBI; Boedeker advanced to third; Kaspar scored. to 2b, SAC, RBI (3-1); Michalec scored. Boedeker singled to center field (0-2). Bosqueville 3rd - Weaver struck out (0-2). English, S popped up to ss (0-0). Tekubie struck out looking (0-2). 0 runs, 0 hits, 0 errors, 0 LOB. Shiner 3rd - Pietsch lined out to 2b (1-1). Downey grounded out to ss (0-1). Lauer popped up to 3b (0-0). 0 runs, 0 hits, 0 errors, 0 LOB. Shiner 4th - Mayberry popped up to ss (2-2). Malina,C struck out (0-2). hit, 2 errors, 0 LOB. bunt (1-1); Gray advanced to second on a fielder's choice. Weaver walked (3-0). on the play. 0 runs, 0 hits, 0 errors, 2 LOB. Pietsch. Malina,M reached on a fielder's choice; Kloesel out at second ss to 2b.